Epoch is going whole hog on team sets this year, putting up a bit of competition to BBM. 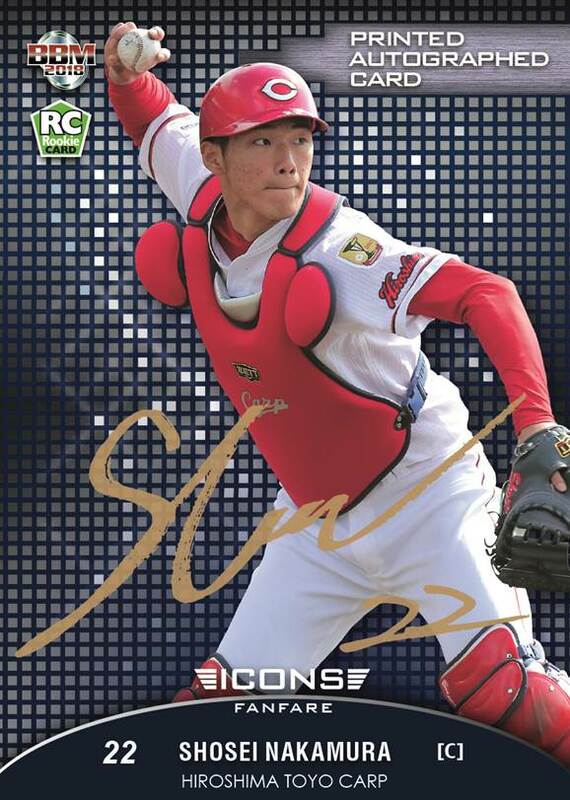 The first set they released, on April 7th, was Carp Rookies and Stars. Each 5-card pack retails for 400 yen, with 20 packs per box and 12 boxes per case. The base set has 90 cards, but that includes variations - up to three for some players. Cards are numbered 1-69. Fifteen players have variations; nine have one variation each, six have two variations each. ( 9 + (6x2) = 21 variations. 21 variations + 69 regular = 90 cards). The variations all appear to be photo variations. Twenty-seven players appear in the regular insert set, titled Franchise Favorites. With 27 cards, you're looking basically at the regular team roster at the top level. The limited insert is titled Rookies, and includes six of the team's rookies (duh?). Regular Red Rookies are #/150. Green Rookies are #/85. Yellow Rookies are numbered to their jersey number; Endoh's yellow parallel is thus numbered to 66 copies. There are 27 Authentic Signatures cards for regular players; these are serial-numbered to 10 or 20 copies each and the checklist almost exactly follows the Franchise Favorites checklist, with a few exceptions. 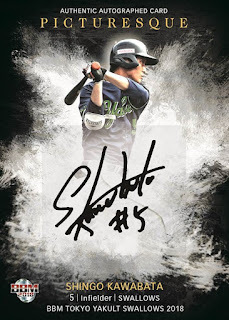 Additionally, the six Rookies players have Authentic Signatures cards with various numbering. Each rookie has three versions with different photos on the front. Numbering differs slightly for some players, but generally the print runs are about 100 copies, 70 copies, and 30 copies. BBM must be taking a huge hit this year with the loss of Ohtani. I'm sure the prospect of pulling his cards from a pack really drives sales of Fighters sets and the general releases BBM does across the year. So naturally they took one last cash grab with Grateful Days. Each box set includes one full base set and one special card for 5000 yen. 3000 total sets were produced. 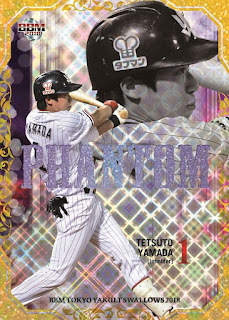 There are only 19 regular cards in the set, featuring highlights of his NPB career. Grateful Days 3D is (surprise!) 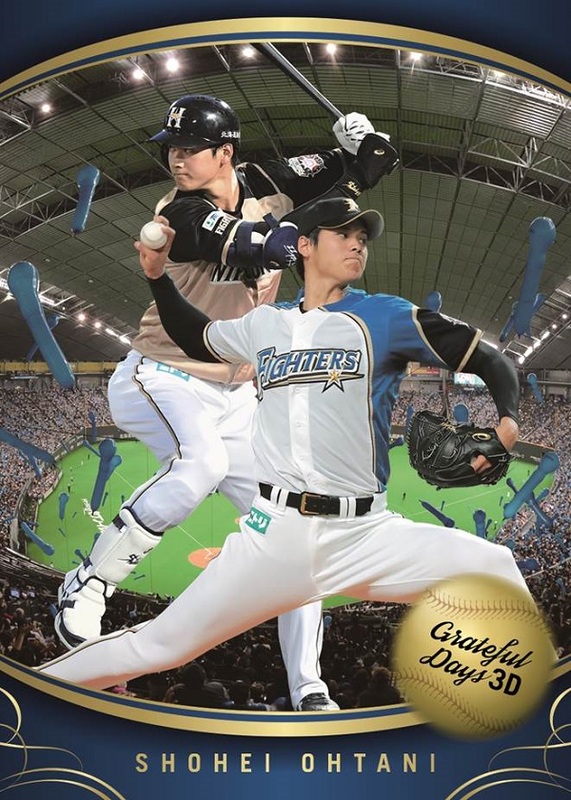 a 3D card. There are three types, batting, pitching, and batting and pitching. Each of the three cards is numbered to 499 copies, with a foil signature parallel #/50. Jersey cards are numbered to 399. Foil signature (seen above) #/199, patch #/50, and big patch #/11. Ball cards are #/199, foil signature parallel #/99, team logo #/11. Bat cards are #/199, foil signature parallel #/99, and barrel #/11. 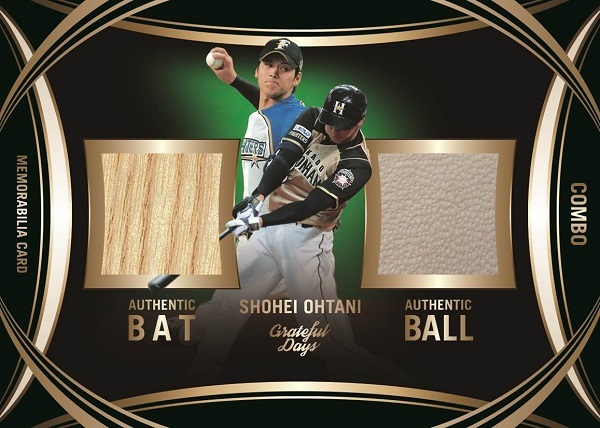 Ball and Bat Combo cards are #/50. Jersey, Ball, and Bat Combo cards are #/15. 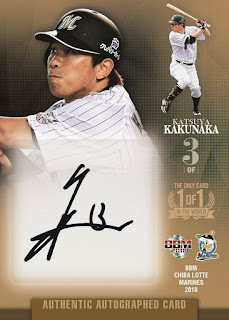 Finally, one Autographed card is #/11. I suppose paying $50 for a 50% shot at a Shohei Ohtani hit isn't so bad, but it's still more than I'm willing to pay. 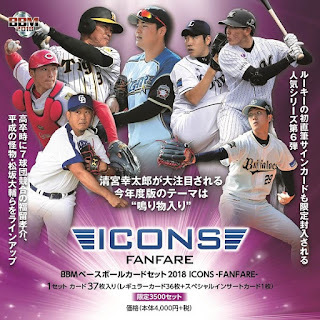 This year's 2018 BBM Icons box set is titled Fanfare, and what that exactly means is a bit up for debate. 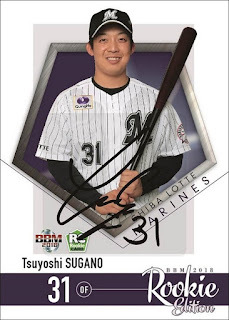 My belief is it focuses on players who broke into professional baseball with great expectations, especially ones who were stars at the Koshien high school baseball tournament. Each box comes with one 36-card base set, plus one special card. Retail price is 4000 yen, and only 3500 sets were produced. The base cards aren't anything special, following the same basic concept BBM has used for this set since its inception. That said, I've been picking up a base Icons set every year from the beginning. 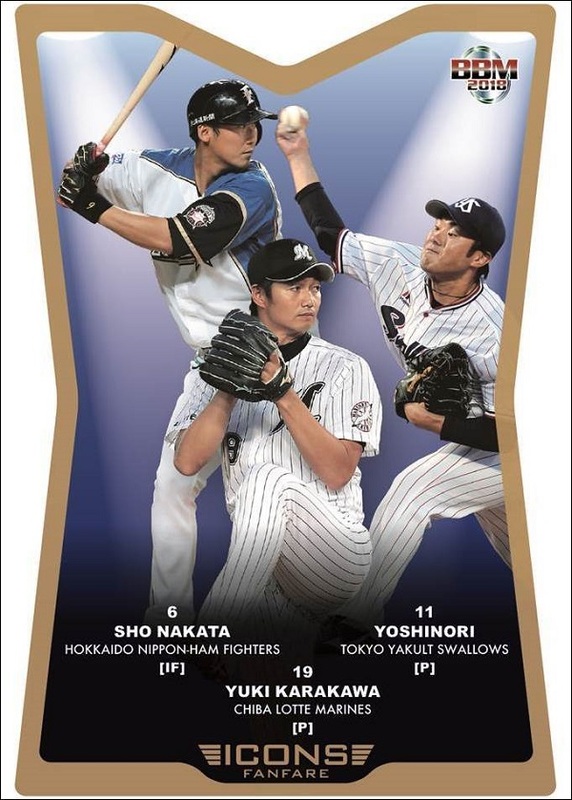 Three players appear in the set for each team. 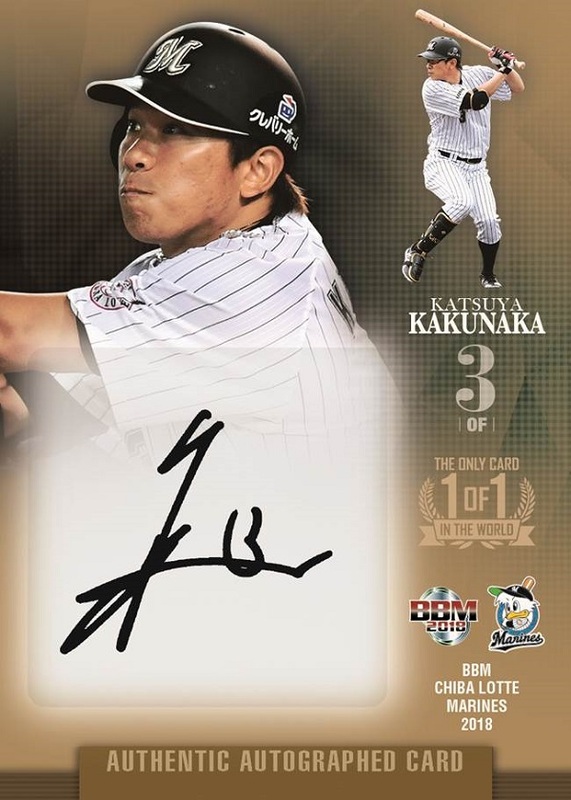 The sticker autograph cards also have three players per team, and without really studying the checklist, I'd guess they perfectly overlap. 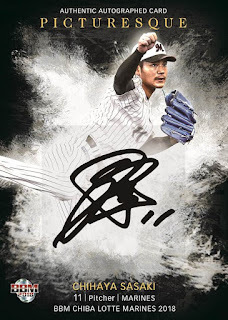 Print runs range from 10 to 30 copies per player, and if I counted correctly, there are 530 autographs total. 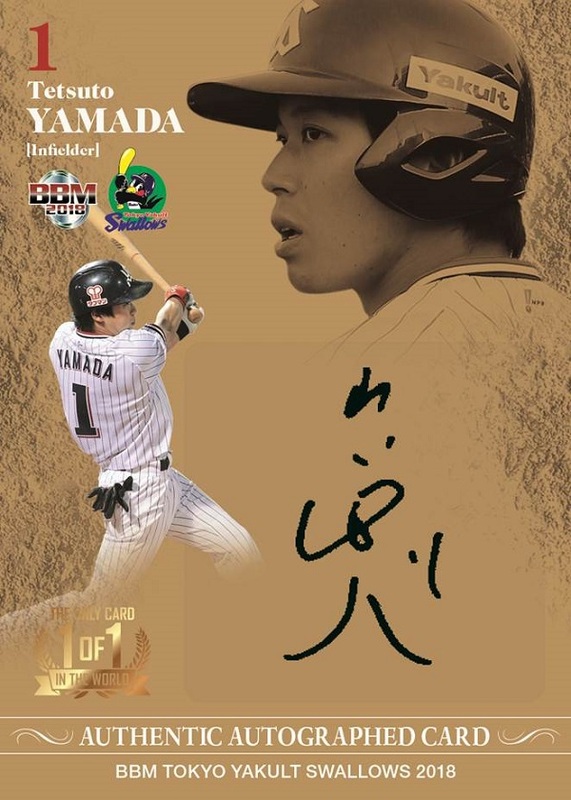 There are 18 Printed Autograph cards, with gold foil signatures. Each card is numbered to 90 copies. A parallel with holofoil is numbered to 45 copies. This makes 1620 gold foil and 810 holofoil cards. Finally, there are six Die Cut cards featuring two or three players each. These are serial-numbered to 60 copies each, with a holofoil parallel numbered to 30 copies each. Total print run, 360 regular and 180 holofoil. And my numbers add up - that's exactly 3500 special cards. 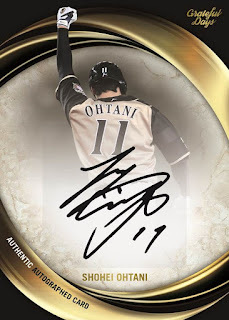 Odds are you'll pull a gold facsimile signature card, followed by the holofoil signature, actual signature, and then die cuts. 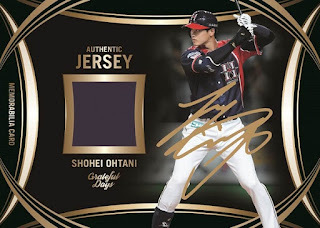 However, each autograph is more limited than any other card, with a few exceptions with the holofoil die cut parallel (six players have autograph cards #/30, the rest are less). Hitting shelves in early April, the same time as the Swallows set, the Marines team set features the standard 81 card base set, 18 insert cards, plus autographs and the cross-set Phantom set. Twenty six-card packs (400 yen each) can be found in each box, with 12 boxes per case. The design on the regular cards is much more colorful and dynamic than before. I don't remember the last time I saw these colors on a baseball card. There are 69 regular cards in the base set, including one mascot card. The subsets begin with First Impact, a four-card subset with the team's newest foreign players. #M70-M73. 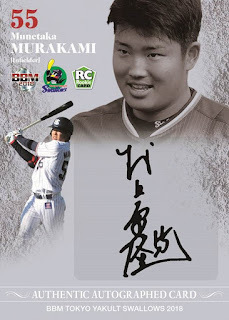 #M74 is Road to 2000, featuring Fukuura's year-by-year hit totals. He could reach 2000 this year, with 38 to go at the beginning of the season, though he hasn't exactly had a productive year since I moved to Japan. U20 Shining features three teenage players who are expected to perform well this year. (I guess Narita had a decent year last year, too.) #M75-77. Finally, Hot Shots has interesting statistical backs. #M78-M81. 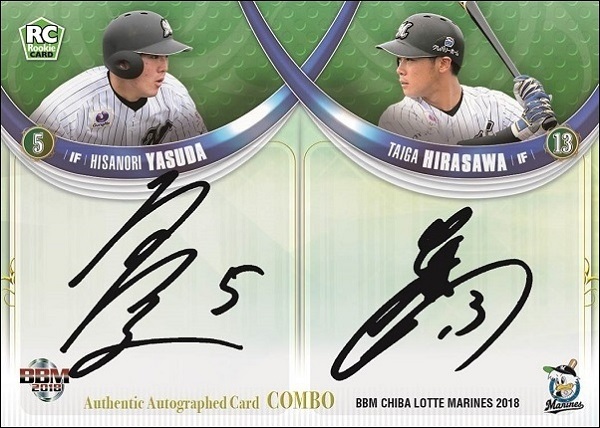 Unlike the Swallows, there are only two regular insert sets for the Marines, both nine cards deep. Jet Stream is the first. Front Runner is the second. There's nothing to really say about them. They're shiny, limited, and lack any explanation why players were chosen to be in the set. Both insert sets have three parallels: a #/100 gold foil, #/75 holofoil, and #/50 gold holofoil. Beyond that, BBM included the super-limited Phantom insert set, with 12 cards each numbered to 25 copies. And turning to autographs, everyone has cards numbered up to 75 copies. Each mascot has their own card as well, though one mascot has a stamped autograph card. Two combo autographs can be found. Both are limited to three copies each. Silver Authentic Autographs are #/9, while Gold are 1/1. Rookie Autographs are numbered out of 5 or 10 copies. This is the first time I can remember seeing a preview for them - they're just Rookie Edition-style cards with a sticker autograph (BBM basically only does sticker autographs). I am curious if they're regular cards with serial numbering and the sticker, or if they have unique backs. 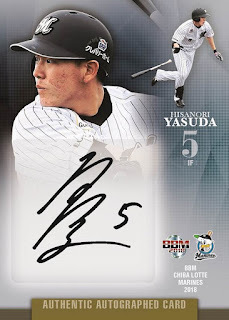 Finally, Picturesque is the attractive cross-set autograph for team sets this year. The first annual team set from BBM this year was the Swallows. BBM is going with a standard set layout that you'll probably see 12 times in the next few months. Six cards per 400-yen pack, 20 packs per box, 12 boxes per case. This set came out in early April. Regular cards fill the first 68 spots in the checklist. This year, I grabbed a rookie for my type collection, but statistics usually fill that space. Speaking of checklists, card #S69 is a checklist. And I should probably mention that #S68 features the three team mascots. The three new foreign players are in the first subset, New Force (#S70-S72). 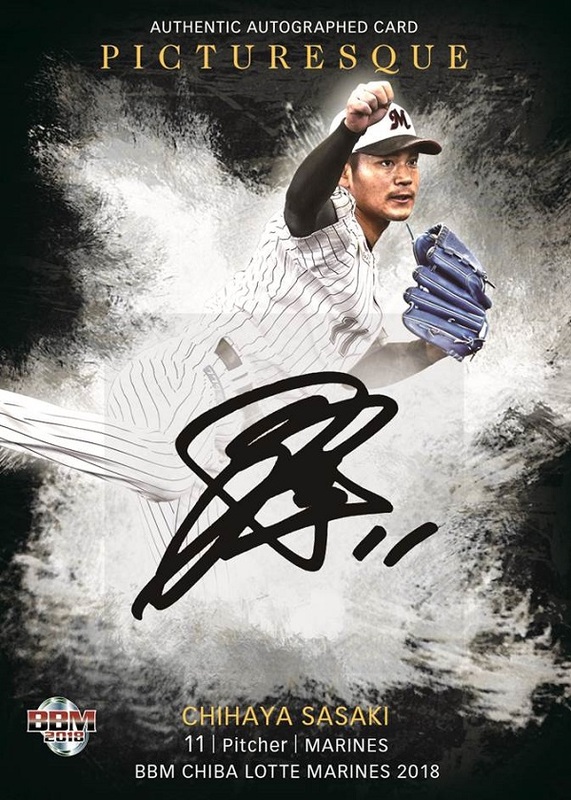 Norichika Aoki came back to Japan this season, and #S73-S75 feature various photos of Aoki in a subset called Welcome Back. Two Combo Cards pair up a couple players with similar attributes. The last four cards in the set are Return to the Field. I wish I knew exactly what that means. Perhaps it's players who had bad/underproductive seasons in 2017. The standard 18 insert cards are split into four different sets. Hopeful Teen, three cards, HT prefix. Teenagers. Bear Fruit in the 3rd Year, three cards, BF prefix. Third-year players. Injected Power, three cards, IP prefix. The team's strongest players. Swallows Rising, nine cards, SR prefix. Basically, the team's starting lineup. All four insert sets can be found in three flavors of parallel: gold #/90, holofoil #/75, and gold holofoil #/50. Last year, BBM created an insert set that was found in every team set called Phantom. This insert is back for 2018, and serial numbered to only 25 copies. There are nine cards in the Swallows Phantom set, with PS prefix. 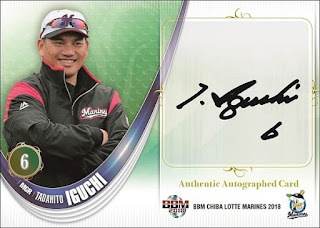 Moving on to autographs, there are several varieties, similar to BBM's offerings in the past. Regular Autographs can be found for everybody, with print runs up to 60 copies each. Combo Autographs can be pulled for two pairs of players (five copies each) and two mascots (60 copies). 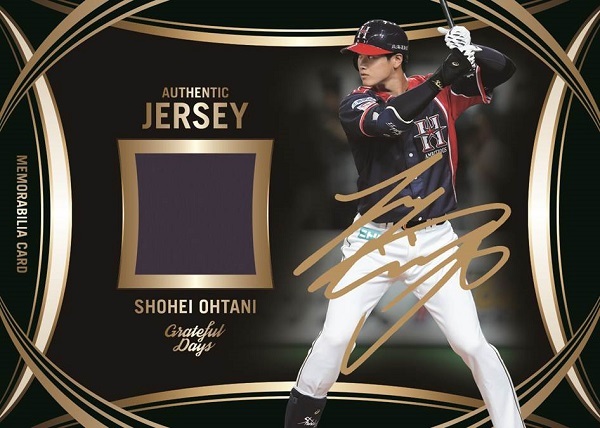 The cross-brand autograph series is Picturesque, and it definitely lives up to its name. I do see similarities to Diamond Kings in the background style, as it is a painting canvas concept. 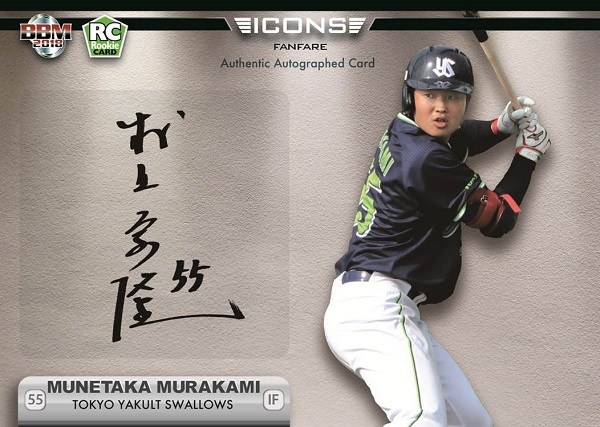 Three players are in this set for the Swallows, with copies limited to 15 cards each. I don't have a sample image, but BBM again included Rookie Autographs for eight players, each numbered to 10 copies. Finally, Silver Autographs(#/5 or #/10) and Gold Autographs (1/1) are lucky pulls. No new ground broken here, but I definitely love the look of Picturesque. It's a Baseball Autograph, I Swear! These Cards are Real. They Aren't Real, Though.